When he was seven years old, his father sent him to St. Mary's Industrial School for Boys, a reformatory and orphanage, and signed custody over to the Catholic missionaries who ran the school. Ruth remained at St. Mary's for the next 12 years, only visiting with his family for special occasions. 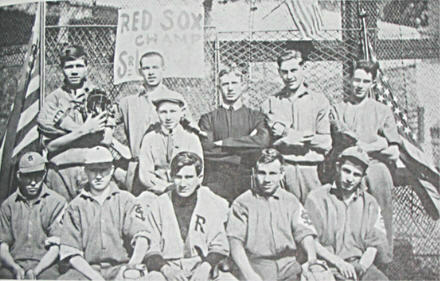 Brother Matthias Boutlier, the Head of Discipline at St. Mary's, first introduced Ruth to the game of baseball. He became a father figure in Ruth's life, teaching him how to read and write, and worked with Ruth on hitting, fielding and as his skills progressed, pitching. During his time in St. Mary's, Ruth was also taught tailoring, where he became a qualified shirtmaker and was a part of both the school band and the drama club. George, Jr. did not have a happy childhood. His parents worked long hours in the tavern, leaving their son to take care of himself much of the time. Eventually, when Babe was seven years old, his father took him to St. Mary's Industrial School for Boys, a reformatory and orphanage. There he signed custody over to the Xaverian brothers, Catholic missionaries who ran the school. During his 12 years at St. Mary's, young George rarely saw his family. They did not come to visit on holidays or on the one Sunday per month when family could visit the boys at the school. Little George was an unruly student, infamously classified as "incorrigible." Much of this was due the young man's inability to adapt to the regimented and structured environment or St. Mary's. Estrangement from his parents led George, Jr. to find a father figure in Brother Matthias, the Prefect of Discipline at St. Mary's school. Brother Mathias would have a very positive influence on George's life, despite his reputation for unruliness. Brother Matthias, a very large, muscular man, became an inspiration to George in baseball as well as in other aspects of his life. The time spent with Brother Matthias not only helped hone George's swing, but the guidance and encouragement gave him much needed support that would translate into George's unfettering love of children in later years.